Gabriel García Márquez is a Colombian novelist, short-story writer, and journalist whose works have earned him the reputation of being one of the greatest living writers in Spain and Latin America. Born in Aracataca, Colombia, on March 6, 1928, Gabriel García Márquez was the oldest of Gabriel Eligio García and Luisa Santiaga Márquez Iguarán's twelve children. His father was a telegraph operator. The family was poor, and García Márquez spent the first eight years of his life with his maternal grandparents. They were the most important and influential people in his life, and he loved listening to them tell stories about Colombia's old days. García Márquez received his early education from the Liceo Nacional of Zipaquirá, Colombia, from which he graduated in 1946. He then entered the University of Bogotá to study law. (He studied for several years but did not enjoy it and never finished.) He wrote his first story in 1947, and it was published in the newspaper El Espectador. Over the next few years he had several more stories published in newspapers. In 1948 civil war broke out in the country and García Márquez moved to Cartagena, Colombia, where he worked as a journalist for the newspaper El Universal. In 1950 he moved to Barranquilla, Colombia, where he wrote for El Heraldo. In 1954 he returned to Bogotá and worked at El Espectador while writing short stories on the side. Between 1955 and 1960 several published works had begun to establish García Márquez's fame in the Spanish-speaking world. La hojarasca (1955), a short novel, is set in the made-up town of Macondo in the swampy coastal area of northeastern Colombia known as the Ciénaga. The story reflects the changes the twentieth century brought to the life of this sleepy country town. Much of García Márquez's work centers around funerals. In La hojarasca mourners who knew the dead man in life think about the past, each from his own point of view. Three different people—an old colonel, his daughter, and her son—tell their story. The dead man, a doctor and former friend of the colonel, had committed suicide. The narrators do not entirely explain what happened, but in the course of each story much of the past history of the village of Macondo is revealed. A strong feeling of doom fills the novel. Macondo and the Buendía family were further developed in El coronel no tiene quien le escriba (1961; Nobody Writes to the Colonel and Other Stories ). The next collection of short stories, Los funerales de la Mama Grande (1962), strengthened García Márquez's growing reputation. The publication of Cien años de soledad (1967; One Hundred Years of Solitude ) created a stir when it sold over one hundred thousand copies in fifteen editions in Buenos Aires, Argentina, in 1969. The story of Cien años de soledad describes the rise and fall of a village as seen in the lives of five generations of one family. It ends with flood and drought, which comes as the last living Buendía figures out the ancient predictions of doom and learns that "races condemned to 100 years of solitude did not have a second opportunity on earth." The family is meant to represent Colombia, and through extension, both South America and the rest of the world. Pablo Neruda (1904–1973), the famous Chilean poet, praised Cien años de soledad, and it is generally considered García Márquez's masterpiece. García Márquez considered his next novel, El otono del patriarca (1975; The Autumn of the Patriarch ), "a perfect integration (combination) of journalism and literature." García Márquez continued to write novels, short stories, essays, and film scripts. In 1982 he was awarded the Nobel Prize in Literature. In 1983 he wrote the film script Erendira, adapted from his 1972 novella (short novel) La increible y triste historia de la candida Erendira y su abuela desalmada ( Innocent Erendira and Her Heartless Grandmother ). García Márquez's other famous novel, El amor en los tiempos del colera ( Love in the Time of Cholera ) was written in 1985 (with an English translation published in 1988). This novel is an exploration of love and the relationship between aging, death, and decay. After Cholera he published the novels El general en su laber-into (1989; The General in His Labyrinth, 1990), Doce cuentos peregrinos (1992; Strange Pilgrims, 1993), and Of Love and Other Demons (1994). realism was often imitated by other Latin American authors, especially Isabel Allende (1942–). García Márquez's need to tell a story drives his writing. In the July 1997 issue of Harper's, García Márquez writes, "The best story is not always the first one but rather the one that is told better." In 1999 García Márquez returned to journalism with the purchase of Cambio, a weekly newspaper in Colombia. He rolled up his sleeves and went to work trying to improve both the paper's content and its sales. His duties ranged from interviewing heads of state and business leaders to editing copy and photographs. García Márquez told the New York Times that he wanted his paper's young reporters "to tell a story, to go back to the time when a reader could know what happened as if he were there himself." Later that year García Márquez was diagnosed with cancer and disappeared from public life. Rumors began to circulate that he was dying, aided by a poem appearing on the Internet supposedly written by him as a sort of farewell. In December 2000 García Márquez gave an interview in which he denied writing the poem and said that he had been keeping a low profile because he was busy writing his autobiography (the story of one's own life), which he decided to do after learning that he had cancer. In March 2001 García Márquez announced that he would never set foot in Spain again unless a new European Union rule requiring Colombian citizens to obtain visas (identification documents permitting travel into foreign countries) before entering Spain was withdrawn. Bell-Villada, Gene H. García Márquez: The Man and His Work. Chapel Hill: University of North Carolina Press, 1990. Dolan, Sean. 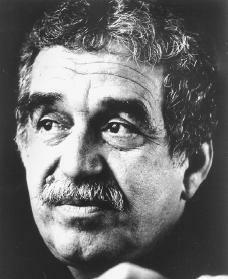 Gabriel García Márquez. New York: Chelsea House Publishers, 1994.
i'm not going tell you that you got some wrong information about "Gabo". but in a very well known web-based encyclopedia gave Gabo's birth year was in 1927.
but here in your page, given 1928 the year of Gabo's birth. so that i'm puzzled. actually which is the correct.it may give me a real help. i'm looking for your feedback here.